BANGKOK -- Two Americans who maintained a social media account called "Traveling Butts" have been arrested in Thailand after posting a photo of themselves at a famous Buddhist temple with their rear ends exposed, police said Wednesday. 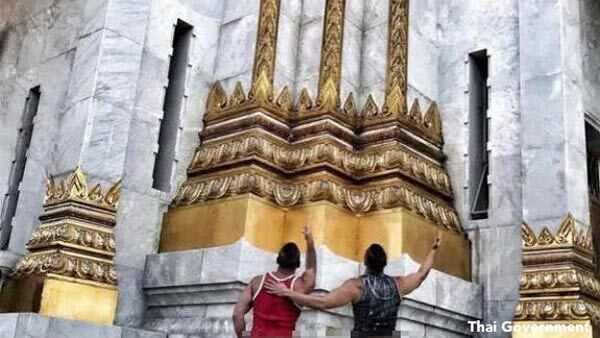 The men caused an uproar in Buddhist-majority Thailand last week after their photo taken at Bangkok's Wat Arun was widely shared, prompting a police investigation. The men, whom police identified only by their first names, maintained a since-deleted Instagram account where they posed for photos at tourist destinations around the world with their buttocks exposed. The account had more than 14,000 followers. Visitors to temples in Thailand are expected to dress modestly and at some sites people are not allowed to wear shorts or shirts that don't cover their shoulders. Police said the men each paid a fine of 5,000 baht ($150) at a police station near the temple and have been handed over to immigration authorities. Police are also considering charging the men under Thailand's computer crimes act as the image was posted online, said Wisit Suwan, the deputy chief of the Bangkok Yai district police station. The controversial law is often used against political activists to stifle free speech online or against those accused of insulting Thailand's monarchy. It carries punishments of up to five years in prison.